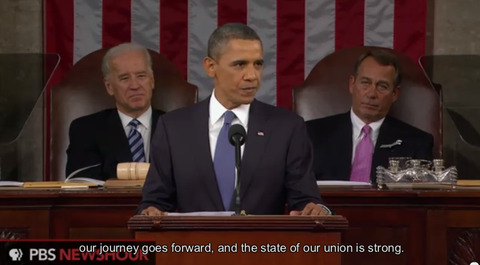 Two years ago, PBS NewsHour partnered with the Participatory Culture Foundation to launch a captioning and translation team of volunteers to subtitle and translate President Barack Obama’s 2011 State of the Union address. Powered through the translation platform Amara, it was an experiment, a modest lunge to explore the Web’s capabilities to reach global communities. With more than 10 languages represented, the hour-long address remains one of the team’s most translated videos. This test run — and a growing team — encouraged the NewsHour to broaden its efforts. The team translated every goal post throughout the 2012 presidential campaign from noteworthy statements during the Republican primary to Obama’s re-election stump speeches. The team also worked hard to translate 20 marquee speeches during the political conventions and followed through to the end of the election with Mitt Romney’s concession speech. In all, the team has translated more than 200 videos — including the Listen to Me project that collected voters’ voices from around the country — into more than 50 languages. The team also concentrated their efforts on videos where politicking was put aside, such as Obama’s emotional statement following the news of the Newtown, Conn., school shooting. The team translated the president’s statement into several languages such as Dutch, Vietnamese and Russian that were available as subtitling options on YouTube once completed. It’s that kind of accessibility that is key. Amara announced last week that you can crowdsource captions and subtitles for your YouTube channel using the subtitling platform. Dwi Rianto, one of our most active volunteers, participates on Amara in between building and maintaining websites for his clients. A web developer from Jakarta, Indonesia, he said accessibility is vital to the passage of information. “When I think and rethink about it again and again, I found that knowledge changes people,” he said. Realizing the challenge of making knowledge accessible to everyone, Rianto hopes that captioning videos will help those with hearing difficulties to feel less marginalized. Another benefit of the Amara platform is it allows the team to catch something that would otherwise be lost. Last year, the video of Chinese civil rights activist Chen Guangcheng’s phone call during a U.S. congressional hearing prompted a reaction from a commenter who noted that not all of Guangcheng’s appeal to come to the States was fully translated. The team was there to make sure all nuances of these cross-language exchanges were captured. With more than 850 volunteers, consider joining the NewsHour’s growing team, and help us translate Obama’s 2013 State of the Union address. What’s the state of our union? We checked back in with people featured in some of our favorite stories of past years and asked what they see in the year to come.